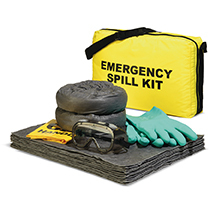 If you don't see a Spill Kit that meets your needs, you can build your own! Order exactly what you want and avoid paying for accessories or PPE that you don't really need. Customize your Kit today … and don't forget the container! 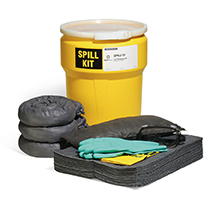 Convenient, portable Kaddie stores sorbent products (not included) for easy access as needed for spill control; saves time when quick response is necessary. Wheels accelerate transport while interior shelves and easy-view compartments keep supplies at-hand and organized. Narrow Kaddie features top and bottom handles for carrying or wheeling. Double-wall molded, water-resistant and lockable for added safety. Vinyl construction with adhesive backing sticks to smooth, curved and irregular surfaces. Self-contained, compact nylon Tote Bag stores sorbent products (not included) for easy access as needed for spill control; saves time when quick response is necessary. Small soft-sided duffel bag offers grab-and-go convenience and is ideal for use in fleet vehicles. Zipper provides secure closure to protect sorbents from dirt and damage. "Spill Responder" printed on one side. Convenient, portable Cart stores sorbent products (not included) for easy access as needed for spill control; saves time when quick response is necessary. Easy-to-locate, bright-Yellow wheeled container rolls quickly to a spill site; fits easily through doorways and aisles. Can also be moved with a forklift. Lockable to protect contents. Rust- and corrosion-free, UV-inhibited polyethylene can be used outdoors and is durable to withstand rough handling. Large, heavy-duty Utility Box has hinged, double-wall lid that is sloped to shed rain; closes tightly to keep out water and dirt. 5" rubber wheels are ideal for smooth or indoor surfaces. Convenient, portable Cart stores sorbent products (not included) for easy access as needed for spill control; saves time when quick response is necessary. Easy-to-locate, bright-Yellow wheeled container rolls quickly to a spill site; fits easily through doorways and aisles. Can also be moved with a forklift. Lockable to protect contents. Rust- and corrosion-free, UV-inhibited polyethylene can be used outdoors and is durable to withstand rough handling. Large, heavy-duty Utility Box has hinged, double-wall lid that is sloped to shed rain; closes tightly to keep out water and dirt. 8" pneumatic wheels are ideal for outdoor or rough terrain. A-BLACKBAG Black Duffle Bag 18" x 11"